Smooth and soft, kind to even the most delicate feet, bamboo is the ideal fabric to use for next-to-the-skin protection, such as these near-invisible in use Elle Stripe and Plain Seamless Bamboo Shoe Liner Socks. The bamboo blend is three times as moisture absorbing than cotton, naturally temperature regulating (it’s those clever little round-ended bamboo fibres – they swell in cold weather and shrink in warm, so your feet stay evenly warm) and naturally anti-bacterial too. 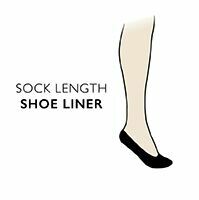 These two pairs of Elle Stripe and Plain Seamless Bamboo Shoe Liner Socks are low cut with no obvious cuff edges, so they’re flat and comfortable, hidden even in the slightest of court shoes. For extra hold, silicone heel grips are placed to keep these stretch fabric liners from sliding underfoot too.